Applying user generated content into pre-existing video game titles has only increased in visibility in recent years. Popular titles from Fallout to Minecraft have proven a veritable wonderland of original user-generated elements for players to get their hands on, most notably allowing the likes of outside characters like Batman and The Legend of Zelda's Link to populate a virtual wasteland or a pixelated, building block-laden landscape. Modding in mainstream gaming franchises has become something of a past time of late, one to rival the appeal of the titles themselves. And it would appear as though Grand Theft Auto V is up for another player-generated upgrade from JulioNIB, which comes on the heels of his Iron Man mod that dropped in August 2015. In the video featured above, this particularly gifted coder showcases his latest Marvel Comics-inspired creation to the city of Los Santos, coming in the form of The Incredible Hulk. Whereas JulioNIB previously offered Tony Stark in all his armored glory, now players can take control of Bruce Banner's emerald alter ego, complete with the character's penchant for smashing objects both large and small, and moving across the game map in huge, thundering leaps and bounds. The animation lacks a little on the back and skin of this new character model, but overall, players are likely to welcome the opportunity to run around the game's giant sandbox world as ol' Jade Jaws. What's more, given the availability of the already released Iron Man mod, players might just start re-enacting that infamous Hulk versus Hulkbuster fight from this past summer's Avengers: Age of Ultron, substituting Los Santos for the showdown's cinematic location. The opportunity to do so may prove too good to pass up, even for the most casual fan of the two superheroes. Players of Rockstar Games' latest release have no doubt thoroughly exhausted the game's playability since the title's initial release in September 2013. As such, original content is always a welcome change of pace. 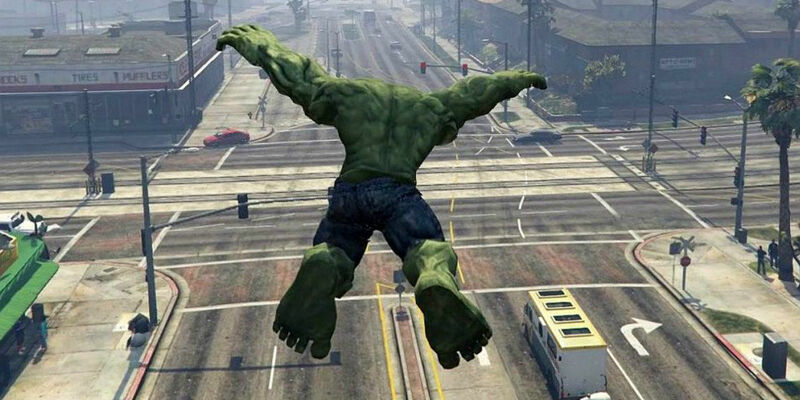 Los Santos has always been a thriving city teeming with a life of its own, but the inclusion of Iron Man and The Hulk can only serve to further animate the population with two more unique player mods. Grand Theft Auto V is currently available for PC, PlayStation 4, PlayStation 3, Xbox One, and Xbox 360.